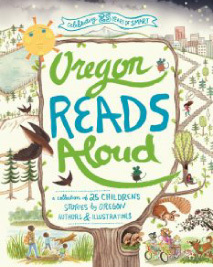 Oregon Reads Aloud (ORA) contains 25 wonderful read-aloud stories for kids, written and illustrated by members in my local children’s literature community. These stories reflect a variety of topics and styles all unified by our common love of Oregon. My contribution to this collection is Something Fishy, a whimsical story about the importance of kindness, inclusion, and acceptance. ORA was published to commemorate the 25th anniversary of SMART (Start Making A Reader Today®), a statewide early literacy nonprofit organization whose mission is to get kids excited and motivated about reading. When you purchase ORA, a portion of your sales proceeds goes to SMART. Click here for a FREE PDF of Oregon Reads Aloud Common Core Activity Guide! ©2005-2018 by Ludwig Creative, Inc. All rights reserved.